A method and system for protecting content on a device is described, the method and system including providing a device, the device being designated for use in at least one premises, the device including a communications element, the communication element being operative to communicate with a control center, the control center being operative to perform at least one of identifying the device, and tracking the device, receiving, at the device, a signal sent by the control center, the signal including an instruction to the device, the instruction including a command to power up, if the device is in standby mode, and a command to provide the control center with device specific identity information, powering up the device if the device is in standby mode, returning a handshake from the device to the control center, thereby establishing a communication session with the control center, sending a device ID to the control center, the device ID including an device specific unique device ID, generating a cryptographic digest of at least one file, transmitting the cryptographic digest to the control center, receiving an instruction from the control center that one of the following is to be performed allowing the at least one file to be accessed, allowing the device to be removed from the at least one premises, deleting the at least one file from the device, and blocking access to the at least one file. Related hardware, methods and systems are described. The present application claims the benefit of priority from US provisional application number 61/274,715 of Arnold Zucker, et al., filed 20 August 2009, the disclosure of which is hereby incorporated herein by reference. US 20090171751 of Zhou, et al. There is thus provided in accordance with an embodiment of the present invention an e-Reader constructed and operative for protecting content and displaying protected content. Accordingly, there is thus provided in accordance with an embodiment of the present invention a method for protecting content on a device, the method including providing a device, the device being designated for use in at least one premises, the device including a communications element, the communication element being operative to communicate with a control center, the control center being operative to perform at least one of identifying the device, and tracking the device, receiving, at the device, a signal sent by the control center, the signal including an instruction to the device, the instruction including a command to power up, if the device is in standby mode, and a command to provide the control center with device specific identity information, powering up the device if the device is in standby mode, returning a handshake from the device to the control center, thereby establishing a communication session with the control center, sending a device ID to the control center, the device ID including an device specific unique device ID, generating a cryptographic digest of at least one file, transmitting the cryptographic digest to the control center, receiving an instruction from the control center that one of the following is to be performed allowing the at least one file to be accessed, allowing the device to be removed from the at least one premises, deleting the at least one file from the device, and blocking access to the at least one file. Further in accordance with an embodiment of the present invention the device includes a storage module. Still further in accordance with an embodiment of the present invention the signal is sent by the control center in one of the following ways a storage medium including the signal is physically delivered from the control center and the storage medium is placed in communication with the device, the signal is sent via point-to-point communications, the signal is broadcast, the signal is unicast, and the signal is multicast. Additionally in accordance with an embodiment of the present invention, the present invention includes the device reporting back to the control center at periodic intervals. Moreover in accordance with an embodiment of the present invention if the device fails to report back to the control center at at least one of the periodic intervals, the device ceases operation until a software reload is performed on the device. Further in accordance with an embodiment of the present invention the software reload includes a full software reload. Still further in accordance with an embodiment of the present invention if the device fails to report back to the control center at at least one of the periodic intervals, at least one file stored in a storage module becomes inaccessible. Additionally in accordance with an embodiment of the present invention the device includes at least one component which, under ordinary operating parameters, is never powered down, the one component being operative to receive the signal broadcast by the control center. Moreover in accordance with an embodiment of the present invention one of tampering with and removing the at least one component renders the device inoperable. Further in accordance with an embodiment of the present invention attempts to power down the device result in the device entering standby mode, thereby resulting in the device being operative to receive the signal broadcast by the control center. Still further in accordance with an embodiment of the present invention and further including the device periodically rousing from standby mode and verifying that communications exist with the control center. Additionally in accordance with an embodiment of the present invention and further including the device periodically powering up from a state of having been powered down and verifying that communications exist with the control center. Moreover in accordance with an embodiment of the present invention and further including a report-back unit included in the device periodically reporting back to the control center. Further in accordance with an embodiment of the present invention and further including disabling the device if the report-back unit is one of turned off, removed from the device, and tampered with. Still further in accordance with an embodiment of the present invention the disabling includes requiring a software reload of at least an operating system included on the device. Additionally in accordance with an embodiment of the present invention the software reload includes a full software reload. Moreover in accordance with an embodiment of the present invention the generating the cryptographic digest is performed in real time. Further in accordance with an embodiment of the present invention the generating the cryptographic digest includes generating the cryptographic digest in non-real time, and storing the cryptographic digest in the storage module. Sill further in accordance with an embodiment of the present invention the at least one file includes an operating system file. Additionally in accordance with an embodiment of the present invention the at least one file does not includes an operating system file. Further in accordance with an embodiment of the present invention and further including signaling a guard that the device should not be removed from the at least one premises. Still further in accordance with an embodiment of the present invention the blocking access to the at least one file includes one of moving the at least one file to a directory inaccessible to the user, and encrypting the file to a key unknown to the user. Additionally in accordance with an embodiment of the present invention communications between the communication element and the control center include secure communications. Moreover in accordance with an embodiment of the present invention the secure communications include encrypted communications. Further in accordance with an embodiment of the present invention the device includes an e-Reader. Still further in accordance with an embodiment of the present invention the device includes a music player. Additionally in accordance with an embodiment of the present invention the device includes a video player. Moreover in accordance with an embodiment of the present invention the device includes a memory device. Further in accordance with an embodiment of the present invention the device includes a computer. Still further in accordance with an embodiment of the present invention the device includes a telephone. Additionally in accordance with an embodiment of the present invention the allowing the at least one file to be accessed is limited to accessing the at least one file within a single premises. Moreover in accordance with an embodiment of the present invention the allowing the at least one file to be accessed is limited to accessing the at least one file within a region within a single premises. Further in accordance with an embodiment of the present invention the at least one file includes a time bound file. There is also provided in accordance with another embodiment of the present invention a system for protecting content on a device, the system including a device designated for use in at least one premises, the device including a communications element, the communication element being operative to communicate with a control center, the control center being operative to perform at least one of identify the device, and track the device, a receiver disposed in the device which receives, a signal sent by the control center, the signal including an instruction to the device, the instruction including a command to power up, if the device is in standby mode, and a command to provide the control center with device specific identity information, a process operative to power up the device if the device is in standby mode, a communications interface operative to return a handshake from the device to the control center, thereby establishing a communication session with the control center, the communications interface being further operative to send a device ID to the control center, the device ID including an device specific unique device ID, a crypto-engine which generates a cryptographic digest of at least one file, a transmitter which transmits the cryptographic digest to the control center, the communications interface being further operative to receive an instruction from the control center that one of the following is to be performed allow the at least one file to be accessed, allow the device to be removed from the at least one premises, delete the at least one file from the device, and block access to the at least one file. Reference is now made to Fig. 1, which is a simplified illustration of a first embodiment of a system for protecting content for display on an electronic reader (e-Reader), constructed and operative in accordance with an embodiment of the present invention. It is appreciated that although the specifications and claims refer to an e-Reader, the present invention may be embodied in any appropriate device, such as, but not limited to, music players; video players; memory devices (such embodiments of the present invention may not comprise rendering of content, however); and so forth. The system of Fig. 1 comprises an e-Reader 100 and a "center" 110. The center 110 comprises some of a processor 120, an encryption key management system 125, a crypto-engine 130, an e-Reader registry 135, a communication interface, and other standard components well known in the art. It is appreciated that the center may be comprised in a plurality of different devices. Additionally, components comprised in the center may be comprised in hardware, software, or a combination of hardware and software, as is well known in the art. The e-Reader 100 comprises a reading screen 150, manually actuated controls 155, and software and hardware, as is well known in the art. Those skilled in the art will appreciate that instead or in addition to the manually actuated controls 155 the e-Reader 100 reading screen 150 may comprise a touch screen which is operative to serve as a user interface for user command input, as is known in the art. The e-Reader 100 further comprises storage, an encryption key management system, and a crypto-engine. The e-Reader 100 is in communication with the center 110. Any appropriate communication protocol may be utilized for the communication between the e-Reader 100 and the center 110. For example and without limiting the generality of the foregoing, communication between the e-Reader 100 and the center 110 may be via wireless TCP/IP communication, via wired TCP/IP communication, via a cellular telephone network, or via Bluetooth communication. Additionally, one way communication systems, such as satellite broadcasting and terrestrial broadcasting systems may provide communication between a remote center 110 and the e-Reader 100. The center 110 typically has access to a software process running on the e-Reader 100. The process has been granted at least read/write permission for files stored on the e-Reader 100 by an operating system which is resident on the e- Reader 100. By way of abstraction, the center itself may be referred to as having at least read/write permission. Alternatively, files comprised on the e-Reader 100 may be of two categories. Files of a first category comprise files which are controlled by the center 110. For such files, the software process to which the center 110 has access has read/write permission, and the e-Reader 100 has either read permission or no permission at all. Files of a second category comprise files which are controlled by the e-Reader 100 itself. For such files, the e-Reader 100 has read/write permission, and the software process to which the center 110 has access has read permission. A user of the e-Reader 100 has at least read permission for files stored on the e-Reader 100. In some implementations of the present invention the user of the e-Reader 100 also has write permission for files of the second category stored on the e-Reader 100. In some embodiments of the present invention the center 110 only has read permission for files stored on the e- ReaderlOO. However, the center 110 will track and monitor the e-Reader 100, and take steps necessary to protect security breaches involving the e-Reader 100, as described herein. Reference is now additionally made to Fig. 2, which is a simplified depiction of an e-Reader 100 of the system of Fig. 1. The e-Reader 100 comprises an RFID tag 205, a GPS system, or other marker which can identify and track an object (for ease of description, hereinafter referred to as the RFID tag 205). Typically, the e-Reader 100 is in the possession of a user for use in a place of work or other premises where security is a concern. In such premises, there is typically a human guard posted at each exit. For ease of description, it will be assumed that there is only one exit. At least one function of the human guard is to prevent the removal of items which may cause security risks or leaks, such as content stored on the e-Reader 100 which might comprise content which may cause security risks or leaks. Thus, one of the duties of the human guard is to prevent the removal of the e-Reader 100 from the premises where security is a concern. Alternatively, a system may be in place whereby the content on the e- Reader 100 is either deleted or rendered not decryptable when an attempt is made to remove the e-Reader 100 from the premises or from a zone of the premises where reading secure content is allowed to a zone of the premises where reading secure content is not allowed (see below). The e-Reader 100 typically comprises an e-Reader processor 210. The e-Reader processor 210 is operatively connected, as is known in the art, with an e-Reader storage 215, which stores files (such as, but not limited to, files for reading or viewing on the e-Reader 100, operating system files, program files, etc.). The e-Reader processor 210 outputs digital versions of text, video, and so forth, to a graphic digital to analog converter 220, which in turn, outputs analog images on the e-Reader 100 screen 150. The e-Reader processor 210 is further operative to receive and process input from a user interface 225, such as the manually actuated controls 155 (Fig. 1) or the reading screen 150 (Fig. 1), in cases where the reading screen 150 comprises a touch screen which is operative to serve as a user interface, as was noted above. The e-Reader 100 further comprises an encryption key management system 230 and a crypto-engine 235, corresponding to the encryption key management system 125, and crypto-engine 130 of the center 110. The e-Reader encryption key management system 230 and a crypto-engine 235 are in communication with each other and the e-Reader processor 210. Those skilled in the art will appreciate that the crypto-engine 235 may be comprised within the e- Reader processor 210. The e-Reader processor 210 typically outputs communications to the center via a communication module 240, which is operatively connected to an antenna 245. Depending on protocol and other concerns, such as deciding with which type of marker system (e.g. GPS, RFID, etc.) to communicate, the communication module 240 may intermediate communications signals between the RFID tag 205, the GPS system, or other marker which can identify and track an object and the e-Reader processor 210. The communication module 240 and the RFID tag 205 are typically associated with at least one antenna 245. Those skilled in the art will appreciate that decisions concerning with which type of marker system to communicate, may involve load balancing, as some communication channels may be busier than others. Additionally, the e-Reader 100 typically comprises a battery 250, which is at least partially controlled and/or monitored by the e-Reader processor 210, in order to apply, where needed, power saving and power-monitoring applications. Returning now to the explanation of Fig. 1, it is appreciated that in some embodiments of the present invention, an element of the e-Reader 100 must remain active in the e-Reader 100 and report back to the center 110 at short periodic intervals. For example and without limiting the generality of the foregoing, the RFID tag 205 may be required to report back to the center 110 every 5, 10, or more seconds. It is appreciated that the frequency of reporting back may be a function of the proximity of the e-Reader 100 to the exit of the premises. Typically, the closer the e-Reader 100 is to the exit, the more frequently the e- Reader 100 is required to report back. It is appreciated that it may not be practical to ensure that the element of the e-Reader 100 must remain active in the e-Reader 100 under all circumstances. Thus, the element of the e-Reader 100 must remain active in the e-Reader 100 under normal operating parameters (for example and without limiting the generality of the foregoing, the battery is not removed). In some embodiments of the present invention, if the RFID tag 205 fails to report back to the center 110, and is turned off or removed, the e-Reader 100 may no longer operate without a partial or full software reload. Alternatively, the crypt-engine 130 may not decrypt encrypted content if the RFID tag 205 fails to report back to the center 110, and is turned off or removed. The center 110 broadcasts a signal to any e-Reader 100 in the vicinity of the exit (S 160). The signal comprises an instruction to the e-Reader 100 to turn on if it is in standby, and to identify itself. In response to receipt of the signal (S 160), the e-Reader 100 powers up (if it was in standby mode) and returns a handshake (S 165), thereby establishing communications with the center 110. In some embodiments of the present invention, the communications between the e- Reader 100 and the center 110 comprises a non-secure communications session. Alternatively, the communications between the e-Reader 100 and the center 110 comprises a secure communications session. Accordingly, the handshake returned in step S 165 ensures the center 110 that the e-Reader 100 is indeed powered up, and provides a secure session key which can be used as an encryption key for the duration of the communication session. The encryption of the communication session ensures that the communication between the e-Reader 100 and the center 110 is genuine and that no eavesdroppers can view the contents of the session. Once communications with the center 110 are established (S 165), the e-Reader 100 sends the center 110 a unique device ID (S 170). The e-Reader 100 then further sends the center 110 a cryptographic digest of each file in the storage comprised in the e-Reader 100 (S 175). The cryptographic digest may be generated in real time by the e-Reader 100, or alternatively, in order to save time, the cryptographic digest could be stored in the e-Reader 100 storage with the file itself. It is appreciated that, in order for step S 160 to operate properly, the e-Reader 100 does not enter a state of being truly powered off. Rather, attempts to power off the e-Reader 100 result in the e-Reader 100 being put into standby mode. Alternatively, the e-Reader 100 may power-off but have some dedicated component which is left on (for example and without limiting the generality of the foregoing, as is well known, in some personal computers, even when the power is off, the LAN card is still functional at a low level of functionality). Further alternatively, the e-Reader 100 may automatically turn on every few seconds or minutes to check that it is in communication with the center 110. It is appreciated that in step S 175 the cryptographic digest need not comprise all of the classic properties of a cryptographic hash, such as collision resistance, first-preimage-resistance, and second-preimage-resistance. The digest's function is to identify the file in a brief manner. The center 110 comprises an e-Reader registry 135 which comprises a database which lists all known unique device IDs and, for each unique device ID has a collection of cryptographic digests for files which were legally (i.e. with the knowledge and consent of the center 110) copied to each e-Reader 100 device. It is appreciated that certain files, for example and without limiting the generality of the foregoing, operating system files may be marked as unclassified, and need not be checked. Alternatively, such operating system files might be checked and approved by the center 110 for removal from the premises. Upon receipt of the cryptographic digest of each file in the storage, the center 110 compares the received hash with the database of unique device IDs and determines if the user is attempting to remove any files which are not permitted to be removed from the center (S 180). It is appreciated that the user may be removing the file in an entirely innocent fashion, for instance, if the user has forgotten that the file was not deleted from the e-Reader 100 before the user attempted to leave. Alternatively, the user could be deliberately attempting to remove information from the premises which should not be removed. Additionally, should the center 110 receive a cryptographic digest of a file which is does not match any of the hashes stored in the database, the center 110 might take action as if the file should not be removed from the premises, as described below. Should the center 110 determine that the user is attempting to remove an e-Reader 100 comprising a file which should not be removed from the premises, the center will alert the human guard (S 185). Additionally and alternatively, the center 110 may also direct the e-Reader 100 to securely delete the file which is not to be removed from the premises, or to block access to the file which is not to be removed from the premises in any appropriate fashion (move the file to a directory which the user may not access; encrypt the file to a key not available to the user; and so forth). A label can be placed over two opposing sides of the e- Reader 100 such that tampering with the e-Reader 100 causes the label to tear. The user of the e-Reader 100 might be required to display the two opposing sides of the e-Reader 100 to the human guard at intervals. A second RFID tag can be embedded in a hidden location in the e-Reader 100 such that, if a first RFID tag is removed, the control center is aware that only one of two RFID tags report. Operating system files can be stored in ROM in the processor (such as a CPU) comprised in the e-Reader 100, thereby making the operating systems harder to tamper with. The e-Reader 100 cover is itself a part of an electrical circuit comprised in the e-Reader 100. If the cover is opened in an unauthorized fashion, the circuit comprising the cover would be broken, rendering the e-Reader 100 inoperable. Reference is now made to Fig. 3, which is a simplified illustration of another embodiment of a system for protecting content for display on an e- Reader, constructed and operative in accordance with an embodiment of the present invention. Fig. 3 depicts an e-Reader 300 while inside the premises 310 referred to above, with reference to Fig. 1. The premises 310 are depicted as comprising a communications network 320. As described above, the communications network 320 may be a wireless TCP/IP network, a Bluetooth communication network, or any other appropriate communication network over which the e-Reader 300 is in communication with a server 325. Although depicted in Fig. 3 as being outside the premises 310, it is appreciated that the server 325 need not actually be physically outside the premises. The e-Reader 300 of Fig. 3 comprises a storage 330, corresponding to the e-Reader storage 215 of Fig. 2. The storage 330 is depicted comprising a decryption key 340, various decrypted content items 350, and a time bound content item 360. The decryption key 340 is only active while the e-Reader 300 is located in communication with the communication network 320. The decryption key 340 is repeatedly downloaded or renewed from the server 325 through the communication network 320 after each access of the content 350. Alternatively, the decryption key 340 is never stored in the e-Reader 300. Rather a one-time use decryption key 340 may be accessed from the server 325 after an appropriate authentication of the e-Reader 300 which includes proof of freshness (in order to avoid replay attacks). Alternatively, instead of requiring that the e-Reader is in communication with the communication network 320, the RFID tag 205 may be used to determine that the e-Reader 300 is within the premises 310. Still another option is for the decryption key 340 to be stored in an encrypted form, encrypted according to a second key. The decryption key could periodically be encrypted to a different version of the second key. Alternatively, the crypto-engine 235 (Fig. 2) is operative to receive and process a content license. The content license may not be processed by the crypto-engine 235 (Fig. 2) if the secure processor 210 (Fig. 2) has been disabled. An explicit command disabling the secure processor 210 (Fig. 2) may be broadcast by the center 110 (Fig. 1) to the e-Reader 300 when the e-Reader 300 is taken out of an exit from the premises 310. Correspondingly, an explicit command enabling the secure processor may be broadcast by the center 110 (Fig. 1) to the e-Reader 300 when the e-Reader 300 is brought in to an entrance to the premises 310. Similarly and optionally, a signal may be broadcast to the e-Reader 300 upon departure from the premises 310 requiring the e-Reader 300 to delete all forms and copies of each file which is presently stored in the e-Reader 300 memory in a decrypted form. Once the e-Reader 300a is no longer in the premises 310, content 350 which was previously decrypted by the decryption key 340 is now no longer decrypted 350a, and thus, unreadable by the e-Reader 300a. Once a file which comprises content 350 which was decrypted is closed, the memory which stored the decrypted content is purged of the decrypted content, using appropriate techniques well known in the art. It is appreciated that periodic polling of the e- Reader 300 occur in order to determine if the content 350 which was previously decrypted by the decryption key 340 should be deleted. It is appreciated that the period of the polling of the e-Reader 300 depends on external factors, such as the range of the communications network and so forth. Those skilled in the art will appreciate that the server 325 may be located in the premises 310. As an additional security feature, the server 325 may be located in a locked room or otherwise secured area, as is well known in the art. Alternatively, as depicted in Fig. 3, the server may be located off-site, and in secure communication with the e-Reader 300 via the communication network 320. Alternatively, documents may not be locally stored at all on the e- Reader 300, but rather remotely stored on the server 325. Thus, when the e- Reader 300a is no longer in communications with the communication network 320, and thus, no longer able to communicate with the server 325, such a document is no longer available. In some embodiments of the present invention, the server 325 may comprise a secure clock. In such embodiments, if the e-Reader 300 loses communication with the server 325 (for example and without limiting the generality of the foregoing, the e-Reader 300 is taken outside of the communication network 320; or alternatively, the e-Reader 300 enters stand-by mode), without receiving a time packet from the secure clock, the e-Reader 300 might not be able to process any content restricted to a time frame which, for the e-Reader 300, still lies in the future. It is appreciated that in order to ensure that a received time packet is fresh a challenge-response based time protocol, as is known in the art, would be implemented. In some embodiments of the present invention, the user may be required to insert a smart card into a smart card reader associated with one or both of the e-Reader 300, or the server 325 on an episodic basis. For example and without limiting the generality of the foregoing, the user may required to insert the smart card into the smart card reader at certain intervals of time, or alternatively, after displaying a certain amount of text on the e-Reader 300. It is appreciated that a contactless smart card may be used, so that, rather than insert the smart card, it may only be necessary to bring the smart card into proximity of e-Reader 300 or the server 325. Alternatively, instead of the smart card, a secure chip, a secure ID, or biometric identification may be required (for example and without limiting the generality of the foregoing, a fingerprint, a handprint, or a retinal scan). The secure chip or secure ID interface may be via USB, SD (secure device), or other appropriate interface. Reference is now made to Fig. 4, which is a simplified illustration of a yet another embodiment of a system for protecting content for display on an e- Reader. In some implementations of the present invention, the e-Reader 100, the e- Reader 100 comprises, a lens 410, an optical system 420, such as, and without limiting the generality of the foregoing, a CCD (charge-coupled device) camera, and face recognition software. When operative, the face recognition software is invoked in a face recognition processor 430 as a face recognition program 440. Reference is now additionally made to Fig. 5, which is a simplified illustration of one implementation of the e-Reader depicted in Fig. 4. The e-Reader 100, through the lens 410 and optical system 420 episodically detects the presence of a user 510. The episodic detection of the user comprises capturing an image of whatever is directly in the line of focus of the lens, thereby producing an image. The image is processed, and further action is taken, as described below. The face recognition program 440 may not be equipped to detect a particular face, 510 as is well known in the art. Rather, the face recognition program 440 is equipped to detect the presence of the face 510 opposite the e- reader 100, regardless of whose face the face 410 is. Alternatively, the e-Reader 100 may rely on either a retinal scan indicating the presence of the reader's eye, rather than the face recognition software or other facial recognition techniques, such as those which rely on facial geometry. In example A, depicted in Fig. 5, the user of the e-Reader 500 is positioned so that the e-Reader 500 is opposite the face 510 of the user. A check mark indicates that in example A, the e-Reader 500 functions normally, and the user may continue to read normally. In example B, depicted in Fig. 5, the user of the e-Reader 500 is positioned so that the e-Reader 500 is not opposite the face 510 of the user. For example, if the user attempts to scan or photocopy text which appears on the e- Reader 500, the face recognition processor 430 prevents the e-Reader 100 from functioning normally. Thus, the text no longer appears on the e-Reader 500, and thus, the text may not be scanned or photocopied. An X is depicted next to example B, in order to indicate that the e-Reader 500 does not function normally. In example C, depicted in Fig. 5, a camera 520 or cell phone comprising a camera 520 is positioned between the e-Reader 500 and the face of the user of the e-Reader 500, so that the e-Reader 500 is not directly opposite the face 510 of the user. Thus, if the user attempts to photograph text which appears on the e-Reader 400, the face recognition processor 430 prevents the e-Reader 100 from functioning normally. Thus, the text may not be photographed. An X is depicted next to example C, in order to indicate that the e-Reader 500 does not function normally. Additionally, the e-Reader 500 software may detect the presence of the camera 520 or other imaging devices, and deny access to the content, as discussed above. It is appreciated that in order to avoid attempts to circumvent the face recognition system described above by placing a photograph opposite the e- Reader 400, the face recognition processor 430 analyzes the image for depth of image, which would be lacking in a two dimensional image, as opposed to a face. The face recognition processor 430 is also operative, in some embodiments, to determine the presence of ocular motion on the part of the face. Alternatively, the e-reader 500 is equipped with a gaze tracking system which uses the optical system 420 to track and monitor where the user of the e-reader 500 is looking. The e-Reader 500 then uses the gaze tracking system to determine where on the e-Reader 500 screen 150 (Fig. 1) the user of the e- Reader 500 is reading. The e-Reader 500 then distorts other portions of the e- Reader 500 screen 150 (Fig. 1). Typically, the distortion of the portions of the e- Reader 500 screen 150 (Fig. 1) is performed by pixelization, the pixelization comprising any of blurring and displaying of the portions of the e-Reader 500 screen 150 (Fig. 1) at a resolution at which reading is difficult. In an alternative embodiment of the present invention, the e-Reader 500 may periodically photograph the face 510 of the user 510 of the e-Reader 500 and send a perceptual hash of the face 510 of user 510 to a security server (such as the server 225 of Fig. 3) in order to compare the hash of the photograph with a database of hashes of photographed faces of authorized users. Alternatively, other facial recognition techniques, such as, but not limited to, retinal matching, facial geometry matching, and so forth, may be utilized to verify that the user 510 of the e-Reader 500 is one of the authorized users. If the hash of the photograph of the face 510 does not match a hash of a photograph of a face stored in the database of hashes of photographed faces of authorized users, security server (such as the server 225 of Fig. 3) sends a message to the e-Reader 500 instructing the e-Reader 500 to perform at least one of the following: cease displaying text; and enter standby mode. Additionally, the security server (such as the server 225 of Fig. 3) may also notify the center 110 (Fig. 1) of a potential security violation. Alternatively, the e-Reader 500 may cause files containing the displayed text to be locked either logically (with a bit so indicating) or by changing the encryption method or encryption key by which the file is encrypted, or by changing the file itself so that the file appears to be an illegal file (for instance, by changing the signature or contents of the file). Alternatively, the photograph of the face 510 and/or the hash of the photograph may be stored on the e-Reader 500 itself or a secure ID or chip associated with the e-Reader 500. The e-Reader 500 may then securely compare the photograph of the face 510 with the stored photograph or hash. Alternatively, if the photograph of the face 510 and/or the hash of the photograph are stored on a secure ID or chip associated with the e-Reader 500, the secure ID or chip may be inserted into the e-Reader 500 or an appropriate interface proximate to the e- Reader 500 and compared with the real time image. Those skilled in the art will appreciate that perceptual hashes are, in the present embodiment, preferred to cryptographic hashes, due to the nature of photographs of human faces. A perceptual hash is a fingerprint of a multimedia file, such as a photograph of a human face, derived from various features from the content of the multimedia file. Unlike cryptographic hash functions which rely on an avalanche effect of small changes in input leading to drastic changes in the output, perceptual hashes are "close" to one another if the features are similar. Furthermore, different photographs of the same person will yield, with high probability, the same perceptual hash values, whereas photographs of different people will yield, with high probability, different perceptual hash values. Thus, minor changes in a face on a day-to-day basis, are less likely to negatively impact the operation of the system of Fig. 5. Alternatively, any secure pattern matching software system may be used to compare the stored perceptual hash with the perceptual hash of the photograph of the face 510. In still another alternative embodiment of the present invention, the e-Reader 500 may comprise a screen of polarized glass over a viewing screen, thereby preventing circumventing the embodiment discussed in Fig. 5 example C by taking a picture of the text displayed in the viewing screen from an angle, such that the camera 520 is not interposed between the e-Reader 500 and the face 510 of the user. In yet another alternative embodiment of the present invention, the e-Reader 500 is only functional in the presence of one or more other e-Readers. For example and without limiting the generality of the foregoing, a student's e-Reader may only be functional in proximity to a teacher's e-Reader. Reference is now made to Fig. 6, which is a simplified illustration of still another embodiment of a system for protecting content for display on an e- Reader 600. A typical e-reader comprises hardware and software, as is known in the art, which is operative to display text based content on the screen 150 (Fig. 1). It is appreciated that the screen may comprise any appropriate screen including, but not limited to, LCD and elnk. Typically, the content is rendered for display utilizing at least one font. Content which is designated as secure content is rendered using a font which comprises elements which are resistant to optical character recognition. In particular, the font utilized to render the text based content comprises modifications which render the text such that a human can still comfortably read the text, but a machine attempting OCR will introduce errors. For example and without limiting the generality of the foregoing, subtle techniques are utilized during the rendering process that will successfully introduce enough letter recognition errors, and layout errors, so as to render the OCR version of the text significantly less valuable than the original. Those skilled in the art will appreciate that OCR resistance can be increased using a combination of varying character sizes in the same font (such as the large "p" 630 in the word "adipisicing" and the small "b" 640 in the word "flabore"), using anti-aliased characters, ensuring that the characters are displayed using abutted spacing (such as the "am" 650 in the word "amet") or extreme kerning (such as the "re" 680 in the word "dolore"), and typographical ligatures between two or more letters (such as rendering lower case "f" and lower case "1" as "fl"), ensuring that similar letters (such as upper case "I" 660 and lower case "1" 670) appear similar in appearance after rendering, and so forth. Likewise, adding additional typographical elements (such as the line 690 connecting between the "c" and the "i" in the word "incididunt") increases resistance of the font to optical character resistance. In Fig. 6, the e-Reader 600 is depicted with text 610 on the viewing screen 620. The text 610 is displayed using a font which is resistant to optical character recognition. Thus, attempts to scan the text 610 and then perform optical character recognition on the scanned image, as is well known in the art, is thereby frustrated. A third character element, corresponding to the lower bar of the letter E, _ 730. The combination of the plurality of character elements F 710; - 720; and _ 730 would comprise the letter E 700. It is appreciated that the choice of the three elements selected, and not three other elements which would also combine to the letter E (for example and without limiting the generality of the foregoing, |-; _; and ) or the choice of using three character elements and not two character elements or four character elements is purely by way of example, and is not intended to be limiting. For e-Reader display screens which operate at a slow enough refresh rate, displaying only some of, but not all of, the character elements on the device display screen for at least one screen refresh period would result in the character being displayed too slowly for many camera shutter speeds or scanners to capture the entire character. On the other hand, the character would appear to the human eye as being displayed in toto. In Fig. 7, each box depicted above the time line is one displaying of one of the three character elements 710, 720, and 730 for a single screen refresh period. 1/125 second and the refresh rate of the display screen is 1/30 second, a three character element character would take 3 X 1/30 second to display, i.e. 1/10 second. The camera would, therefore, only be able to capture one of the character elements. In order to capture all of the three character element characters in this example the camera would have to have a shutter speed of less than 1/10 second. 8.27 inches / 4 seconds = 2.0675 inches / second Assuming a font size of 12 point on average for the font displayed on the e-Reader (this varies depending on a variety of factors, including the resolution of the display screen, the material used to manufacture the display screen, and so forth), a theoretical 12 point font character which occupies the full 12 points is 0.16667 inches high. A display refresh rate should be chosen such that the character elements all appear as a single letter to the human eye. Additionally, the refresh rate should be chosen so that the refresh rate is faster than the 0.0806 seconds needed to scan a character. Accordingly, a refresh rate of at least 15 Hz (0.067 seconds) should be chosen to satisfy both of these requirements. If the character is segmented into three elements, as in the present example, 3 x 0.067 seconds = 0.20 seconds would be needed to display the entire character. Thus, scanning the entire character in 0.0806 seconds occurs too quickly in order to capture all of the character elements comprising the character, since only a single element of the character is displayed during a single screen refresh period. The above example relates to a case where the camera or scanner is too fast to capture the entire letter E 700. In an alternative embodiment, a blocking character, such as the number 8, could be displayed very briefly thereby preventing a slow scanner or camera from recording a character correctly. Reference is now made to Fig. 7A, which is a simplified illustration of an alternative embodiment of the system depicted in Fig. 7. For example if character elements 710, 720 and 730 are each displayed for 1/15 second and blocking character element 740 is displayed for 1/60 second, which is generally faster than the human eye can register, the character E 700 would appear to the human eye as being displayed in toto correctly, while a scanner or camera would see only the character 8 715. It is appreciated that in some embodiments, if the screen refresh rate of the viewing screen 620 is sufficiently fast, then a scanner or a camera might be too slow to capture the text displayed, if for instance the camera ISO setting is too low. Reference is now made to Fig. 8, which is a simplified illustration of yet another embodiment of a system for protecting content for display on an e- Reader 800. In Fig. 8, the e-Reader 800 is depicted with text 810 on the viewing screen 820. By way of example, the embodiment of the present invention depicted in Fig. 8 is described with reference to a single letter "r" 830 which is part of the text appearing in the viewing screen 820. 1. The document decryption key may be intercepted used to decrypt the document. The decrypted document is then saved and may be redistributed. In this case, the plain text version of the decrypted document is, in principle, identical to the plain text version of the encrypted document. 2. The document may be subjected to one of photographing, scanning, and optical character recognition, in order to produce an unprotected version of the document for redistribution. A document produced in this manner is not in principle, identical to the plain text version of the encrypted document. It is appreciated that using attack number 1, described above produces a file which, when subjected to a binary comparison with the source file will produce a nearly perfect match. On the other hand, a file produced using attack number 2 will still preserve the layout and contents of the source file, but will not produce a match when subjected to a binary comparison with the source file. It is appreciated that once the document is saved in its plain text form, as discussed above, a photographed, scanned, or otherwise subjected to optical character recognition version of the document may then be prepared. Aside from the methods discussed above which describe techniques for resisting optical character recognition, it is advantageous to be able to identify the source of a pirated document, once such a document is obtained. Various watermarking and fingerprinting techniques may be applied to the production of such a document, as described below. Typical characters, when displayed on a displaying device, such as a viewing screen are comprised of pixels. In a typical character, such as the letter "r" 830 of Fig. 8, the letter appears as a solid area, typically of a single color, often black. However, in the embodiment of the present invention depicted in Fig. 8, the letter "r" 830 is depicted as having a small zone which is not solid, unlike the remainder of the letter "r" 830. Rather, the letter "r" comprises a small zone 840 which is not solid, but is not apparent to an eye of a viewer possessing typical visual acuity. Nonetheless, the letter "r" 830 comprises an embedded watermark 840. The embedded watermark 840 is depicted in Fig. 8 as comprising a string of zeros and ones 850, that is to say, a string of bits. A watermark comprised of a string of bits may comprise information relating to any or all of: a device ID of the e-Reader 800; a user ID of the user of the e-Reader 800; a document ID, if, for instance, the displayed text is one of a series of numbered copies of the document being read; and any other information which might be useful in identifying a potential source of a leak of the document. For example and without limiting the generality of the foregoing, if a copy of the document is found to be illegally distributed, the embedded watermark 540 and the bits 550 comprised therein can be used to identify a potential source of a leak of the document, such as the actual e-Reader 500 device from which the document was leaked, or the user to whom the e-Reader 500 device from which the document was leaked is assigned. In yet another alternative embodiment of the present invention, the embedded watermark 540 may comprise a microscopic or near-microscopic version of a logo or other uniquely identifying graphic element. Returning to the discussion of the case where the document decryption key may be intercepted used to decrypt the document. As was noted above, the decrypted document is then saved and may be redistributed. In this case, the plain text version of the decrypted document is, in principle, identical to the plain text version of the encrypted document. It is appreciated that although the discussion herein centers on text based documents, any appropriate content item, including, but not limited to text, graphics, video, and audio content may be subject to the methods described herein. The set of content item elements may be denoted E, such that E = (Ei9 E2, ... E1, ... Em}. Each user of the e-Reader is typically associated with some unique user information. The unique user information may comprise the user's name, or the user's user identification number, or some other information associated with the user. The unique user information is converted into a string of bits, using techniques well known in the art. The string of bits, hereinafter denoted SQ, is parsed by a parser into a plurality of subsequences of strings of bits, hereinafter denoted Si; ..., Sn, the parsing being performed such that SQ equals a function of Si; ..., Sn. Examples of the parsing would be to break up a 32 bit string into 16 two bit strings. In such a case, the function may be concatenation. Alternatively, Si; may be equal to the first and last bits of So; S2, may be equal to the second and penultimate bits of So, and so forth. Those skilled in the art will appreciate that the parser is typically disposed in a computer, frequently in a processor or other appropriate hardware. Alternatively, the parser is a software based parser, in which case the parser software is typically invoked by a processor. A matrix of content replacement items is developed, the matrix denoted R, the matrix comprising at least n rows, each row of matrix R corresponding to at least one of n members of set E. There are at least n rows of R corresponding to at least one of n members of set E in order that each possible combination of subsequences of bits which may occur in Si, ..., Sn, may be matched with a corresponding element from row Rn of matrix R. (It is appreciated that in certain cases, matrix R may comprise only one row). One element of R, Ry corresponding to Ej and Sj is replaced in the content item. The replacement of Ej with Ry for the corresponding Sj is recorded in a record stored by the computer processor performing the steps mentioned herein. The process of replacing content item elements in set E with members of matrix R is performed repeatedly, typically until at least one content item element in the content item has been replaced for each one of the subsequences of Si, ..., Sn. Matrix R is populated by matrix elements having a similarity criterion to the content item element to be replaced by said matrix element. The basis of the similarity criterion is that a typical user of the content item will either not notice the replacement, or if the replacement is noticeable to the typical user, the replacement will not result in a reduction of the quality of the consumption or use of the content item. Examples are now provided first for video and graphic content items. For video and graphic content items, the set E comprises a plurality of pixels, in at least one embodiment. Each pixel in a video frame or in a graphic element has a coordinate, and is typically associated with one of a color value (for color pictures) or a grey scale value (for black and white pictures). It is appreciated that various color systems are in use, including, but not limited to RGB (red-green- blue), CYMK (cyan, magenta, yellow), CIE, chrominance-luma (YUV), and so forth. For the purpose of this example, the RGB color system is used, but any color system may be used. In the present example, where SQ is divided into twelve subsequences of bits, at least twelve pixels in the content item are selected. where x and y indicate the coordinates at which the pixel is located in the frame/graphic. In the case of video, the frame in which the pixel is located is denoted by f. The color of the pixel is indicated by the subscripts R, G, and B. In the present example, for ease of the present description, assume that either a single video frame or a picture is being discussed. In the case of video, a frame number would be added as well. 11, increase the green value by 1). Alternatively, the change could be performed in a pseudo-random fashion. Small changes of this fashion in individual pixels typically result in video and graphic files which should be nearly or totally indistinguishable to a viewer of the file. In video files where the twelve replaced/changed pixels may be spread out over thousands of frames, the change should be even less noticeable. The tradeoff is that the replaced pixels result in the unique user information being embedded in the file. If the file is subsequently decrypted and the plaintext then made publically available, the owner or controller of the content will be able to determine the source of the file. As was noted above, if a video or graphic is black and white, then the gray scale can be altered in developing the replacement table. It is also the case that, for a text document, characters in the document can be related to as graphic elements as well. "r" 830 is depicted as appearing, almost, entirely, in one color (typically black). Two of the pixels comprising the character "r" 830, pixel 910 and pixel 920, are depicted as having a different gray scale than the body of character "r" 830. 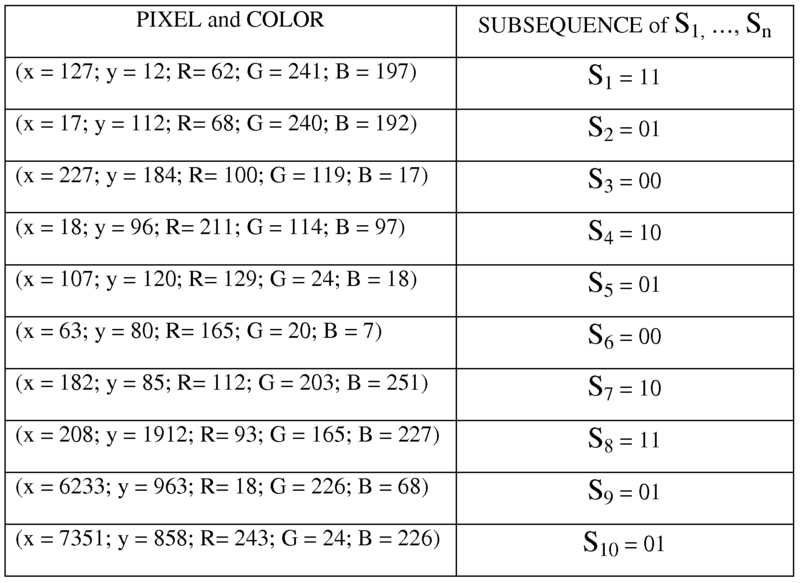 Thus, pixel 910 might have a gray scale of 93%, corresponding to and pixel Ss = 11; pixel 920, corresponding to Sβ = 00 might have a gray scale of 97%. Such variations in single pixels will typically be either indistinguishable to a reader of the text 810 or will not interfere with the reading of the text 810 displayed on the e-Reader 800. It is appreciated that although the two pixels pixel 910 and pixel 920 are depicted as appearing in a single character "r" 830, this depiction is merely presented this way as a matter of convenience. 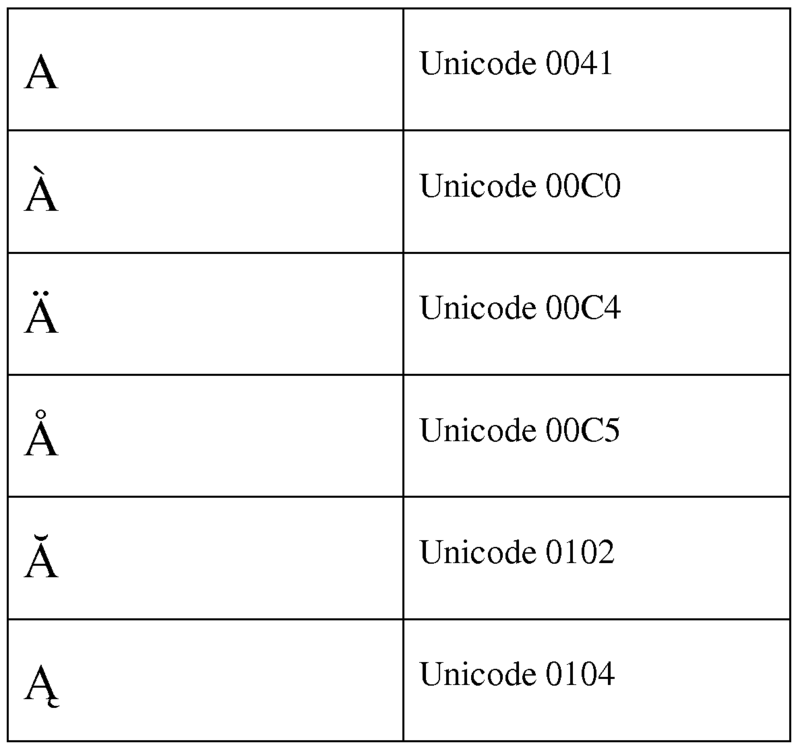 The first of the three characters appearing above is the character "A", designated in the Unicode standard as Latin capital letter A, having the Unicode value 0041. It is appreciated that aside from the Greek small letter alpha, the characters grouped together are indistinguishable to the typical reader. Furthermore, the typical reader would have no trouble reading the phrase "typical reader" correctly. Characters presented in the above table may be substituted, using the system presented above, for the character A. A typical reader would have little or no trouble reading a word with such a substitution correctly. Reference is now made to Fig. 10, which is a simplified illustration of a sixth embodiment of a system for protecting content for display on an e- Reader 1040, 1045,. Fig. 10 depicts a system whereby different versions of a document to be displayed on an e-Reader 1040, 1045 are authored so as to produce slightly different versions of the document 1050a, 1050b. By storing a record of which e-Reader 1040, 1045 receives which version of the document 1050a, 1050b, it is possible, at a later time, to determine which e-Reader 1040, 1045 is the source of a leak, should one of the versions of the document 1050a, 1050b be discovered to be leaked. One implementation of such a system is now described. When authoring the document, the author of the document may suggest synonyms for several words comprised in the document. Alternatively and additionally, alternative spellings of words (for example and without limiting the generality of the foregoing, color/colour; center/centre; program/programme, etc) could be used for several words comprised in the document. Further alternatively and additionally, subtle misspellings may be suggested for some words comprised in the document for example and without limiting the generality of the foregoing, informal/imformal; truly/truely; rescusitate/resuscitate, etc.). Alternatively, grammatical variations may be used, for example and without limiting the generality of the foregoing, commas, semicolons, and colons may be placed or omitted in various places throughout the document. An electronic version of the document 1010, which includes all of the different synonyms, alternative spelling, and misspellings which were proposed by the author of the document, is uploaded to an electronic document authoring system 1020. Each e-Reader 1040, 1045 to which a version of the document is loaded, receives a slightly different version of the document 1050a, 1050b from an electronic document authoring system 1020 management unit 1030. Each different version of the document 1050a, 1050b, or a cryptographic hash thereof, which is issued to a different e-Reader is stored in a database along with a device ID 1070, 1080. In such a case, should a suspicious copy of the document be obtained, and it is determined that the copy of the obtained document has been illegally distributed, by comparing the obtained copy of the document (or the cryptographic hash thereof) to the database 1060 of versions of the document 1050a, 1050b, it is possible to determine which e-Reader 1040, 1045 is the source of the illegally distributed version of the document. In an alternative embodiment of the present invention described in many of the various embodiments of the present invention described herein, different portions of the source document 1010 may be tagged as being available to different levels of security clearances (for example and without limiting the generality of the foregoing, secret, top secret, eyes-only, etc.). If the e-Reader 1040, 1045 to which the an electronic document authoring system 1020 management unit 1030 is to issue the document 1050a, 1050b is not cleared for a certain security level, then only those portions of the document 1050a, 1050b tagged with allowed security levels may be distributed to the e-Reader 1040, 1045. It is appreciated that the various embodiments of the present invention described herein may be implemented individually in an e-Reader device or in combination with each other. For example and without limiting the generality of the foregoing, the embedded watermark 840 of Fig. 8, or the embedded watermarks 910 and 920 of Fig. 9 may be embedded in a character in the optical character recognition resistant font of Fig. 6 or 7. Similarly, the selectively authored document of Figs. 8 or 9 may be displayed in the optical character recognition resistant font of Figs. 6 or 7, where some letters comprise the embedded watermark 840 of Fig. 8, or the embedded watermarks 910 and 920 of Fig. 9, on an e-Reader device which is operative to detect that the face of the user is directly in line with the display screen, as described above with reference to Fig. 5, and so forth, with implementations of all of the various embodiments of the present invention described herein. Reference is now made to Figs. 11 - 15, which simplified flowcharts of preferred methods of operation of the various embodiments described herein. Figs. 11 - 15 are believed to be self-explanatory in light of the above discussion. It is appreciated that software components of the present invention may, if desired, be implemented in ROM (read only memory) form. The software components may, generally, be implemented in hardware, if desired, using conventional techniques. It is further appreciated that the software components may be instantiated, for example: as a computer program product; on a tangible medium; or as a signal interpretable by an appropriate computer. blocking access to the at least one file. 2. The method according to claim 1 and wherein the device comprises a storage module. 4. The method according to any of claims 1 - 3 and further comprising the device reporting back to the control center at periodic intervals. 5. The method according to claim 4 and wherein if the device fails to report back to the control center at at least one of the periodic intervals, the device ceases operation until a software reload is performed on the device. 6. The method according to claim 5 and wherein the software reload comprises a full software reload. 7. The method according to claim 4 and wherein if the device fails to report back to the control center at at least one of the periodic intervals, at least one file stored in a storage module becomes inaccessible. 8. The method according to any of claims 1 - 7 and wherein the device comprises at least one component which, under ordinary operating parameters, is never powered down, the one component being operative to receive the signal broadcast by the control center. 9. The method according to claim 8 and wherein one of tampering with and removing the at least one component renders the device inoperable. 10. The method according to any of claims 1 - 9 and wherein attempts to power down the device result in the device entering standby mode, thereby resulting in the device being operative to receive the signal broadcast by the control center. 11. The method according to any of claims 1 - 10 and further comprising the device periodically rousing from standby mode and verifying that communications exist with the control center. 12. The method according to any of claims 1 - 12 and further comprising the device periodically powering up from a state of having been powered down and verifying that communications exist with the control center. 13. The method according to claim 1 and further comprising a report- back unit comprised in the device periodically reporting back to the control center. 15. The method according to claim 14 and wherein the disabling comprises requiring a software reload of at least an operating system comprised on the device. 16. The method according to claim 15 and wherein the software reload comprises a full software reload. 17. The method according to claim 1 and wherein the generating the cryptographic digest is performed in real time. generating the cryptographic digest in non-real time; and storing the cryptographic digest in the storage module. 19. The method according to claim 1 and wherein the at least one file comprises an operating system file. 20. The method according to claim 1 and wherein the at least one file does not comprises an operating system file. 21. The method according to claim 1 and further comprising signaling a guard that the device should not be removed from the at least one premises. encrypting the file to a key unknown to the user. 23. The method according to any of claims 1 - 22, and wherein communications between the communication element and the control center comprise secure communications. 24. The method according to claim 23 and wherein the secure communications comprise encrypted communications. 25. The method according to any of claims 1 - 24 and wherein the device comprises an e-Reader. 26. The method according to any of claims 1 - 24 and wherein the device comprises a music player. 27. The method according to any of claims 1 - 24 and wherein the device comprises a video player. 28. The method according to any of claims 1 - 24 and wherein the device comprises a memory device. 29. The method according to any of claims 1 - 24 and wherein the device comprises a computer. 30. The method according to any of claims 1 - 24 and wherein the device comprises a telephone. 31. The method according to any of claims 1 - 30 and wherein the allowing the at least one file to be accessed is limited to accessing the at least one file within a single premises. 32. The method according to any of claims 1 - 31 and wherein the allowing the at least one file to be accessed is limited to accessing the at least one file within a region within a single premises. 33. The method according to any of claims 1 - 32 and wherein the at least one file comprises a time bound file. block access to the at least one file.